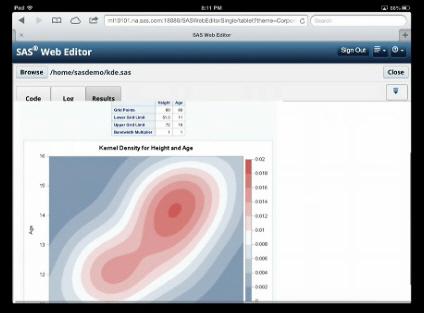 I’ve already written about one highlight of SAS Global Forum 2013: the SAS Web Editor. Here are some more features that I think deserve mention. Please note that I make no claims about the comprehensiveness or completeness of this list. ODS POWERPOINT destination The usefulness of this destination is obvious. There will be two new styles designed specifically for PowerPoint: one with a white background and one with a black background. You can use other styles too, but these new styles have the advantage of being fully compatible with the PowerPoint theme selector. Any graphs you create using ODS Graphics will be embedded in this destination. ODS LAYOUT If I remember correctly, the first time I ever heard about the ODS LAYOUT statement was at SUGI 28 in 2003. I don’t know why it has taken so long to move to production, but I’m glad it’s finally here. If you need custom reports that combine results from multiple procedures, then you will probably love ODS LAYOUT. PROC ODSLIST and PROC ODSTEXT These new procedures allow you to create bulleted lists and formatted blocks of text in reports. The content can be static or dynamic (based on a data set). ODS Graphics The SG procedures continue to mature. When I attended Dan Heath’s super-demo on SG procedures, members of the audience repeatedly said “Oh, good, I need that.” New features include a SORT= option in SGPANEL, insets in SGPANEL, split characters for tick and axis labels, and PERCENT and MEDIAN options for STAT=. Enterprise Guide For a long time, one of the problems with Enterprise Guide was that it kept evolving so quickly that users felt like they had to learn it all over again with each release. EG users will be glad to know that EG 6.1 uses the same basic layout as EG 4.2 and 5.1. Improvements in EG 6.1 include sticky notes and a log summary to help people who write code. Developer Casey Smith said there will be better integration with the ODS Graphics Editor. I am glad to hear that ODS Graphics is being supported in EG, and I would like to see this dramatically increased. EG users should have the best graphics that SAS can offer. SGF is finally global 28 percent of attendees were from outside the US. I have attended SGF and it’s predecessor SUGI for decades, and most of that time I didn’t see a single attendee from outside the US. It’s exciting to see SAS Global Forum living up to its name. Opening Session The Opening Session was informative and included an amazing performance by the dance troupe Les Ombres. Roger Craig’s talk about how he used analytics to train to be a contestant on Jeopardy! was fascinating. SAS Global Forum ended two weeks ago. I thought by now someone would have written about SAS on the Mac and saved me the trouble, but since I don’t see much discussion of this in the blogosphere, here are my belated two cents. If you have been using SAS as long as I have, then you probably know that running SAS on a Mac is nothing new. SAS Institute released SAS for the Mac lo these many years ago, but then dropped it just a couple years later because there weren’t enough users (read licenses) to justify it. And since then, of course, Mac users have gotten several different products that allow them to run Windows software. So anyone who really wants to run SAS on a Mac has had that ability for a while. 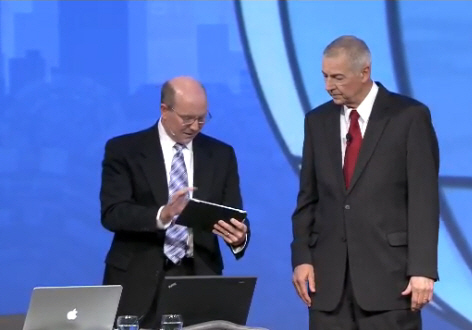 Given that history, the last thing I expected to see at the Opening Session was a demo of SAS on the Mac–much less on the iPad. Of course, this is not the same SAS for the Mac that was dropped so long ago. This is the SAS Web Editor. The SAS Web Editor is a nimble version of Display Manager that runs in a browser (any HTML 5 compliant browser). I learned about it just over a month ago when my husband mentioned to me, as we ate dinner, that he had read an interesting blog describing the SAS Web Editor. Thank you to AnnMaria deMars for getting the word out! Here is an official press release from SAS Institute dated March 6, 2013. The SAS Web Editor is a client-server application. The editor is the client. To use it, you must have SAS running on some server. That server can be local or remote. Considering how aggressively SAS Institute has promoted cloud computing over the last decade, it is perhaps surprising that it has taken this long to come up with Display Manager for the Web. The SAS Web Editor feels like a missing link. It makes a lot of sense. A few other interesting tidbits about the SAS Web Editor: It is not exactly the same as Display Manager, but the developers showing it in the Demo Room made it clear that they are working hard to get the kinks out. It is currently available only for academic use, but in the Opening Session it was said that it will be available as a free download–no mention of when. They also mention that it will be available for Android platforms. You can still view the Opening Session online. The SAS Web Editor demo starts around 1 hour in. One of the problems that Lora Delwiche and I face as authors of two books with similar titles (The Little SAS Book and The Little SAS Book for Enterprise Guide) and multiple editions (five of LSB and three of LSBEG) is explaining how the books are different. The two books are totally different–and complementary. So I was delighted to see that someone at SAS Press has written a great summary comparing the various editions. Did you know that the title The Little SAS Book was originally a joke? We explain that and give a little history on sasCommunity.org.